Hello, I am new here so I hope I don’t make too many mistakes. I am researching the Naumowicz Family from the Wołyn region. I’ve been lucky in being able to find quite a few records that have helped me tremendously. 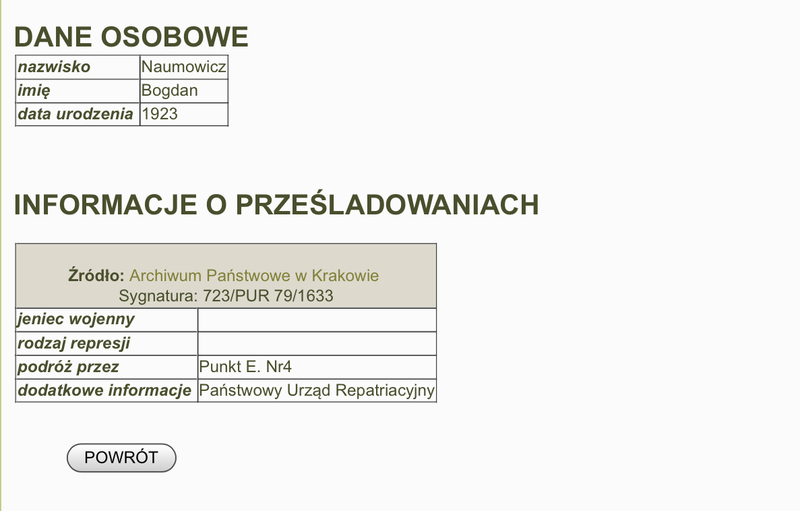 Specifically I am searching for the following Naumowicz. Aureli Naumowicz 1893- 1971. His wife Bronislawa died in 1941. His children included: Antoni, Florian, Bohdan, and Aurela. His parents were Jozef and Jozefa. I would really like to be able to locate a death record for Bronislaw. I was able to locate this record of Bohdan but I don’t understand the entry. I was hoping someone would be able to help me understand it. I know that Aureli, his son Antoni and his daughter Aurela were taken to Germany and stayed there after the war before coming to the United States. In Aureli’s obituary it states that he was proceeded in death by his sons Bohdan and Florian. Florian was killed in 1943 but I don’t know what happened to Bohdan. I will definitely check out that website. Thank you. Hello Palkos25. I was Antoni Naumowicz's stepdaughter. He married my mother Lottie Slugocki (born Lipnicki) in Kenosha. Aureli used to babysit us-- and I knew Anela's family (Olbrys) very well in my childhood. I've often wondered exactly what happened to Antoni and his family during the war. I'm responding to this thread because I am a writer/scholar and work hard at understanding our family dynamic which, in some cases was good, but in other cases, very bad. I've always tried to understand the level of trauma in my stepfather's life as a solution or answer to his actions. People, my family, including my mother, really never wanted to talk about the war, and it's disruptions and it's trauma, but as I've learned, this is then passed down to the next generation. I wonder why you are researching the family, and what perhaps I can learn from you. Thanks. I’m researching the Naumowicz family for a friend of mine who’s grandmother was Aurelia Olbry new Naumowicz.